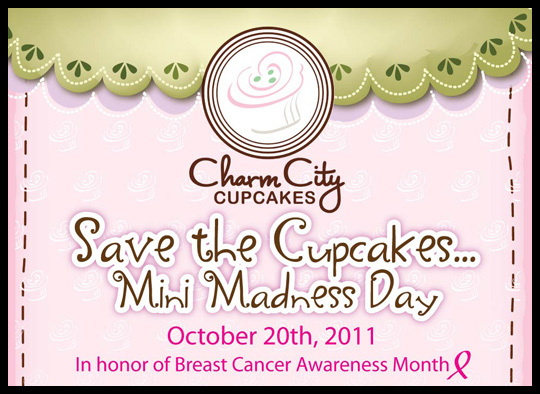 Last week I was informed that Charm City Cupcakes was honoring Breast Cancer Awareness Month by donating a portion of the proceeds for every dozen of mini cupcakes that were ordered. Since the Crusaders and I were planning to join three other ladies in the mountains of Pennsylvania over the weekend (and I was put in charge of sweets) I knew this would be the perfect treat to bring. Six girls, two mini cupcakes each, breast cancer awareness, what could be more perfect? I was hoping to get a complete mixture of cupcakes, but was then told that there was a minimum of 6 cupcakes per flavor, so I went with two flavors: Chocolate Cannoli and Almond Raspberry. I placed the order on Tuesday to be picked up on Thursday from their Mt. Washington location. I believe that the gentleman behind the counter was the same who helped me before because he was just as friendly and easy going as I remember. He retrieved my order quickly, and then went over all the flavors that day so that I could call my office and take some back to my co-worker. He was patient while I was on the phone, and I never felt rushed or like I was bothering him. 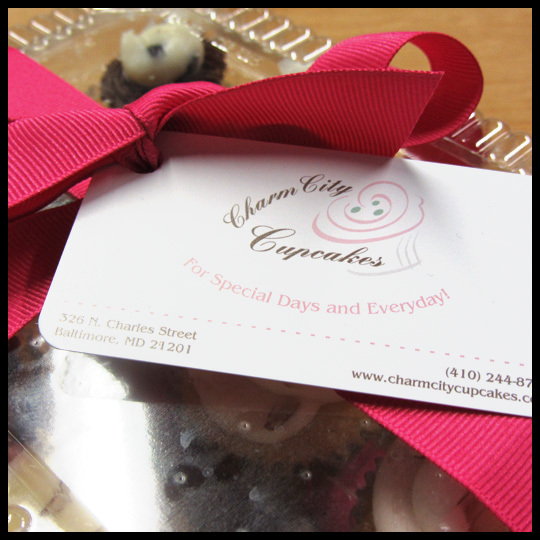 Charm City Cupcakes took the time to add a nice touch of “charm” with pink ribbon representing breast cancer awareness and their business card. I knew these would be a big hit with the girls. 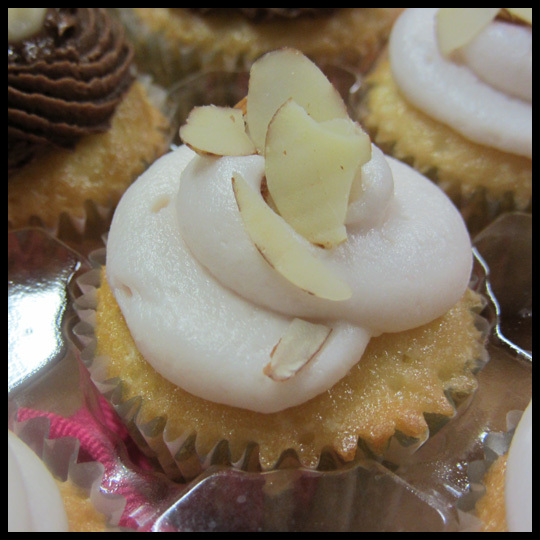 I enjoy experiencing cupcakes with others to discuss different opinions on the flavors and hear what the favorites are, so as tempting as these look to eat, I was able to hold out until the weekend. Two days later, we were ready for some sugar! (Or I should say “more sugar” since we had french toast with pure maple syrup for breakfast thanks to Crusader Jenn who doubles as a french toast making pro). I was slightly afraid that these tiny treats would have dried out, but happy to say that they didn’t. Of the two, I think that this one didn’t stand out to me because of the amazing Orange Cannoli cupcake that Elisa and I had from CakeDreams. Of the five girls who tried this (one friend wasn’t ready for hers) we were the only two who didn’t find it the best of the bunch. I think our taste-buds will forever be loyal to that Orange Cannoli cupcake. 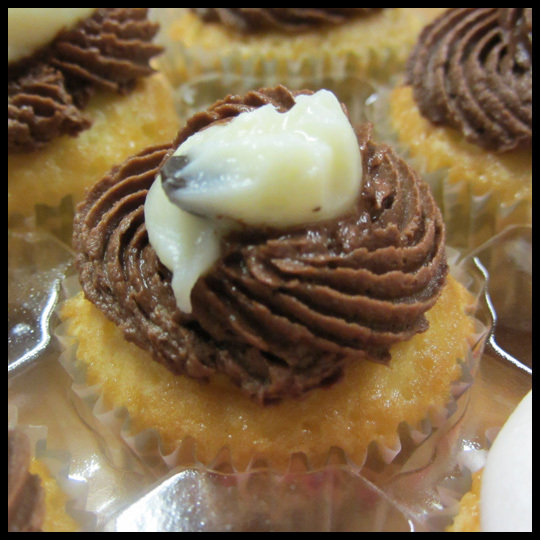 Also, when I picked the cupcakes up, I was a little surprised that the cake wasn’t chocolate. Since it was a “Chocolate Cannoli” cupcake, I expected full on chocolatiness. However, that may have overpowered the cannoli filling that was present as a filling and as a garnish on top of the chocolate frosting. The most important part of this cupcake, the cannoli cream, was everything I want in a cannoli cream. It seemed to have a bit of cinnamon, or another spice in it, which I thought worked well. Also, it was perfectly smooth and not gritty like some not-so-great cannoli’s I’ve tasted before. However, I’m curious to hear Elisa’s thoughts on the actually cannoli cream, since she is the expert. I’m kicking myself now for forgetting to ask her. I love almonds and raspberries, and when the two are combined I think it is a harmonious blend that was meant for each other. 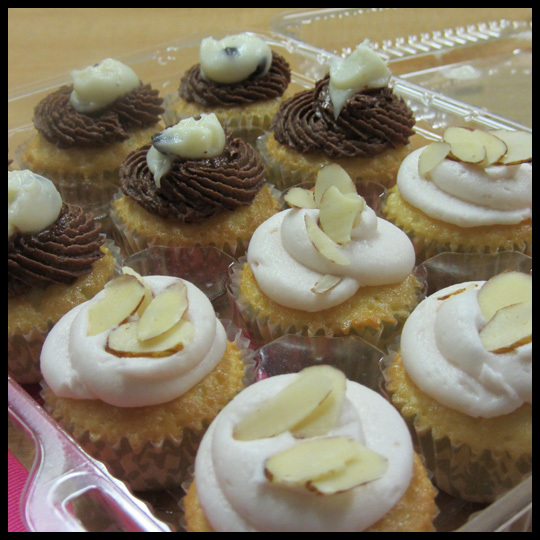 Elisa has mentioned before how she prefers her almond paired with fruit so, for us, this hit the spot. I typically stay away from fruit infused frostings because I do find that they can sometimes taste like cheap candy, but this frosting seemed like it was made with fresh raspberries, and not some syrupy mixture from a bottle. The other girls thought that it was too sweet though, but maybe since it was just a mini cupcake, I thought it was fine? Or maybe my sweet tooth was in overdrive that day? Either way, I enjoyed every morsel of that bite sized cake. Luckily the weekend was filled with more tasty treats, and the fun didn’t stop at these cupcakes. This week, we will share more of the other sugary foods we enjoyed on our girls weekend getaway. 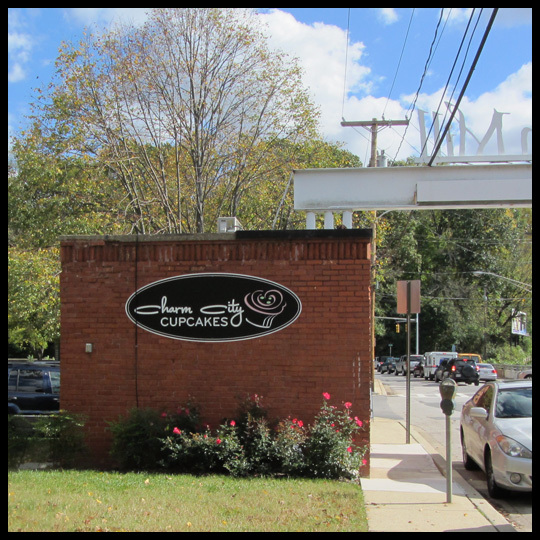 This entry was posted in Baltimore, Cupcakes, Maryland and tagged Almond, Breast Cancer Awareness, Charm City Cupcakes, Cupcake by Stacy. Bookmark the permalink. I didn’t think the almond raspberry was too sweet from my taste. I just REALLY liked the chocolate cannoli! For such a mini cupcake I couldn’t believe how much the cannoli flavor stood out. I’m glad they went with the vanilla cake, because the chocolate icing paired with the cannoli cream on the top and bottom were enough to give it that rich flavor. But, since you and Elisa have been ruined by the Orange Cannoli cupcake you had, now I must try that one! the dollop of cannoli cream on top looks really really unappetizing!